The IPA's Dignity of Work Research project is guided by the moral case for work. Providing a sense of purpose, the opportunity of work enables us to build rewarding and fulfilling lives for ourselves and our families. Here you will find the IPA's analysis of employment and workplace relations issues, and ideas to reduce the regulatory barriers to work. 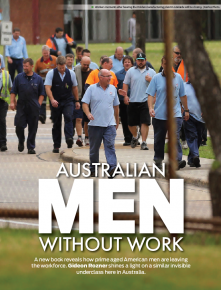 The IPA’s Gideon Rozner looks at the mass exodus of working-age men from the labour force. The IPA’s Gideon Rozner explains why the Fair Work Act is one of the most unfair and unbalanced pieces of legislation in Australia’s history.